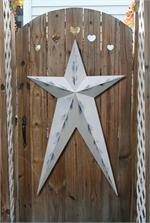 Our HEAVY DUTY metal barn stars come in many sizes and colors including Rustic colors. Rustic stars have a black underlay with your choice of color feathered on top. Black shows through the feathered areas for a more rustic look. Our metal barn stars feature 22 gauge galvanized metal so you never have to worry about them rusting on the back of the star. Rustic stars are an excellent way to create the decor of your choice. Choose the color that will accent your indoor and outdoor home decor. Below are the color samples of our rustic color stars and sizes available from 10" to 10'. Rustic colors have a black underlay with your choice of color feathered on top. Black shows through the feathered areas of your color choice. These heavy duty painted metal barn stars are very sturdy and durable. They are made from 22 gauge metal and guaranteed not to rust! www.MetalBarnStars.com hand paints your Barn Stars with premium quality Severe Weather paint. The 24" metal stars are an excellent size to add flair to your home decor outside or inside. 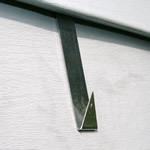 No matter what size, color, or finish our heavy-duty metal stars are built to last. 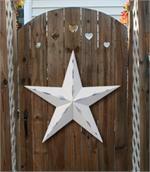 These 32" and 40" barn stars are the most common size star that most people apply to their homes. These long rustic metal stars open the world for your home and garden decorating! You get to be the artist with these very unique long metal rustic stars and create the design you want. These 20" x 32" long 5 pointed rustic stars will look stunning in your home decor or outdoors no matter what kind of decor you have with our many different colors. These 23" x 39" long 5 pointed long metal stars will add a touch of personality to your home. Display long rustic stars for all your guests to see and let them be in awe of your unique creative home decor.